Fermented Cranberry Sauce: Full of Probiotics for your Holiday Table. One of my favorite holiday foods is cranberry sauce. A few years ago, when I was first getting in to fermenting, I knew I need to come up with a fermented cranberry sauce. Like most of you, what graced our table when I was growing up was the the gelatinous version with the ridges left from the can. I loved it! Honestly, I still love it, but we try very hard to avoid food that comes in cans because of the BPA. Even BPA-free cans have a chemical called BPB that will probably turn out to be just as harmful as BPA. Acidic foods such as cranberries and tomatoes are some of the worst foods to eat from a can because the acid eats away at the can, leaching the chemicals into your food. Anyhoo…. This version of cranberry sauce, uses raw honey instead of sugar. Raw honey contains vitamins, minerals, antioxidants, and beneficial bacteria, whereas sugar contains nothing of value for your body. This fermented cranberry sauce only requires a short fermentation (about 48 hours) to produce plentiful probiotics for your microbiome and make the nutrients in the cranberries more bio-available (usable by your body). Fermented foods help your body digest protein (especially when eaten at the start of the meal), so this will be a good accompaniment to those heavy holiday meals. Your tummy will thank you and so will your mouth. Making cranberry sauce takes only a few minutes. Now that we can readily get fresh, organic cranberries at holiday time, there really is no excuse for not making your own. (Ok, I can actually think of about 100 reasons why you might not have time to make your own, but if you do have a spare 5 minutes, do it!! 🙂 I would like to breakdown cranberry nutrition for you before we get to the recipe. As always, the printable version of the recipe is at the bottom of the post. Cranberries are loaded with antioxidants and are anti-inflammatory. They contain vitamin C, E, and K.
Cranberries lower blood sugar and triglycerides. They contains proanthocyanins, which keep harmful bacteria from sticking to the urinary tract. Sterilize 1 quart jar or 2 pint jars. Put the starter culture into a small bowl and pour the apple juice over it to let it sit while you work. Next, mix the cranberries, honey, sea salt, and orange juice in the bowl of a food processor. You can mix until it is smooth or leave it chunky, your choice. If you want it really smooth, like the cans from childhood, you will need to blend it in a high powered blender. Finally, stir in the zest and the starter culture/apple juice mixture. Pour the cranberry sauce into your jar(s). Top with airlock lids. Let the jars sit on your counter, out of direct sunlight, for 2 days (48 hours). A delicious, nutritious fermented cranberry sauce. Have you ever made your own cranberry sauce? 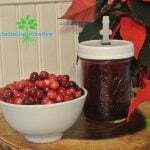 Have you ever made fermented cranberry sauce? Previous Post Elderberry Syrup: Why My Family Takes it in Lieu of a Flu Shot Every Year (and How to Make your Own). Next Post Cranberry Kraut: Lower inflammation and feed your microbiome. Hey, I love your post. I recently wrote an Blog Post on preserving gammon. I like to make my own gammon for Fall!. We will be creating a nice ice cream to go with it. The kids will be off school and I am sure they are going to enjoy it. I really love your web site, it has interesting content, Have a nice day! Probiotic Tartar Sauce: Homemade and So Tasty!